The ultra volgory rays, the most powerful spy weapon used by the secret service of the Invisible Government in charge of Interplanetary peace, detected that the Legions of Javak have returned to planet earth. Camouflaged as monks of the Brotherhood of Mercy and protected by their kavaj, a shape shifting devised that also makes them invisible, these dangerous spies have returned to planet earth to plan their final strategy - "OPERATION CHAOS." The purpose of this operation is to retrieve the golden cross hidden in a chest in a secret chamber below the great pyramid of Giza. Once they have the golden cross they can gain access to the Atlantean formulas and to the most coveted word in the universe. By its very utterance, this word will release their powerful Commander Van Floy Karzan instantly. 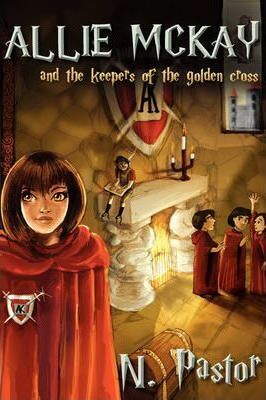 Will Allie Mckay and the other seven young Alchemist knights bidden to carry out their mission by the Invisible Government, be able to prevent the Javaks from carrying out their evil plan? That plan is to use the secret Atlantean de-and re-materialization formulas to vaporize all of planet earth and its inhabitants and transport them to Javakland in the second dimension where earth's people will be captive and used as personal labors for all the Javaks whims and wishes. Author N.Pastor, an alchemist as well as an extraordinary creative genius, has created ALLIE MCKAY in response to an inner calling to reach every young person in the planet with an inspiring yet entertaining story of valor and high ideals. "It is the children, tomorrows leaders, who are the protectors of the planet and defenders of world peace," states N. Pastor, "and it's through them that we can make a better world."